I am now able to see the wildlife such as deer, and swimmers, Jet ski's, boats and water parachutes behind my Lake House like never before. These Perrini High Definition Binoculars bring in those far away things to seem as if they are right in front of you. The view is like a truly Crisp & Clear HIGH DEFINITION picture of what I am looking at and I don't get tired of holding them up because they only weigh 2 pounds, 3.7 ounces. They feel Big and Powerful in my hands and they come with an easy to turn dial that controls the magnification and I don't get tired of holding them up because they are so lightweight which helps me enjoy the view a whole lot longer. 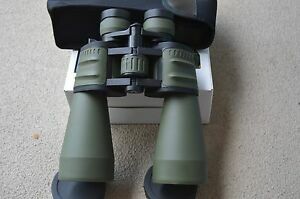 I highly recommend these Binoculars because they provide a HIGH DEFINITION picture, are lightweight to hold up and come at a low cost.